Maybe its because my roots are in the fishing industry, I don't know, but I am really enjoying the Discovery Channel programme: The Deadliest Catch. The film makers follow the quest of 8 crab boats as they struggle against the treacherous sea and weather conditions in the Alaskan waters of the Bering Sea. 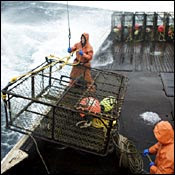 They are out to catch the opilio crab hiding at the bottom of the icy sea with 800lb cages. The fishing season is only weeks long as the crew engage in one of the deadliest — and most lucrative — jobs in the world. Jesus called his disciples to be "fishers of men". These guys are willing to risk everything to catch Alaskan Crab. Why? Money. Money motivates them to get out of bed, leave home, work in crazy weather and risk injury and death. Crab fishing may be one of the most dangerous and lucrative jobs in the world but sharing the gospel is the most dangerous and lucrative jobs in eternity.